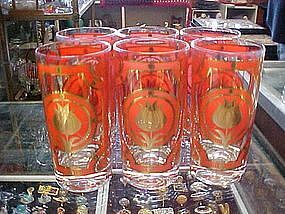 Pretty retro drinking glasses have an orange tulip design and are embellished with LOTS of 24 K gold. Glasses measure 5 3/4" tall and all are in perfect condition! They look like they have never been used.